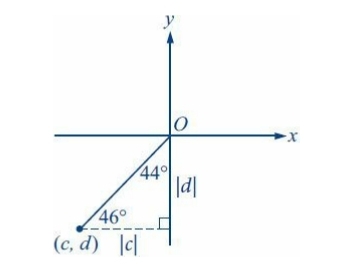 Note that if you draw a horizontal line segment from the point (c, d) to the y-axis, you form a 44°- 46°-90° right triangle, with a horizontal leg of length |c| and a vertical leg of length |d|, as shown in the figure below. In the triangle, the horizontal leg is opposite the 44° angle and the vertical leg is opposite the 46° angle. Since the 44° angle is smaller than the 46° angle, the length of the horizontal leg is less than the length of the vertical leg; that is, |c| < |d |. Since c and d are both negative, it follows that c > d.
The correct answer is Choice A. Is it right to think about the fact that if the angle would have been 45°, then the line would have been the one with slope 1, thus passing through all the points with same x and y-coordinates? Then, since the angle is lower than 45°, it means that the slope of the line is greater than 1 and thus the x-coordinate is lower than the y, which stays the same. Then, the answer is A!